Updated Sunday April 7, 2019 by GRLL Information. 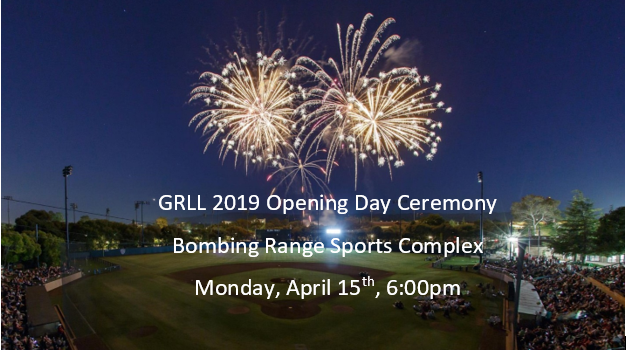 The 2019 Opening Day Ceremony is on Monday, April 15th on Bombing Range Field 1. The event officially begins at 6:00pm but players need to be in full uniform and ready to line up into teams at Bombing Range Field 1 outfield fence by 5:30pm. Hats will be available for pickup. Families can sit in the stands or bring lawn chairs and/or blankets. Remember to dress according to the weather - and take into account it is always a little breezier and colder up on Bombing Range! We look forward to seeing you as we kick off the 2019 season!